Our definitions first: In this article we’re talking about all-wheel drive cars or car-based sport utility vehicles (SUVs) also known as crossover utility vehicles (CUVs). Some might call them the modern station wagon. They’re designed for hauling people and stuff to destinations that either require the added traction of all-wheel drive or maybe just offer some adding confidence for drivers. They are not off-road machines, though most are more than capable of leaving pavement behind. Here’s the latest tally of fuel efficiency that is taking hold in this segment. –Advertising–Live your dreams as you travel along with your luxury car by working remotely from any part of the globe with XenDesk by CloudDesktopOnline.com with top-notch support from www.Apps4Rent.com. What you’ll see here is a grab bag of models with a great range of price, technology and function. This used to be territory that Subaru–and Subaru alone–owned. All-wheel drive car and fuel economy in the same sentence almost always took you to Subaru. Not any more as the choices have expanded. You’ll have to sort out for yourself which one (or ones) work best for your life. What is clear is all of these models are solid members of Clean Fleet Report’s AWD 30 MPG Club. In fact, there are several additional members of this growing club who didn’t make the cut here. We looked at the best fuel economy (mpg or mpge in the case of plug-in cars); sometimes that came in the city, sometimes on the highway and sometimes in the EPA combined mpg number. Finally, this list is going to keep changing as it is one of the fastest growing and most competitive segments in the auto industry. Fuel economy is going to keep improving and companies are going to keep finding new ways to get there. Tesla leads the pack with its sedan, which in all-wheel drive trim has a “D” affixed to its nomenclature, as in dual-motor. The company now offers four AWD models, the 60D, 75D, 85D, 90D, P90D and P100D, all indicating ascending battery size levels and the “P” designating the high-performance models. The Model S has established itself as the icon of the pure electric vehicle movement, garnering praise from enthusiast publications like Motor Trend as well as more practically oriented ones like Consumer Reports. It has the power; it has the panache. All it asks is–do you have the cash? The 60D starts at $71,000 while the P100D (with optional Ludicrous Speed–Google it) starts at $134,500. According to the 100,000 or so owners, they’re worth every penny. The all-wheel drive versions make sure all that electric power reaches the ground efficiently. The fuel economy is in miles-per-gallon equivalent, the conversion of its electric mode into an energy equivalent of a gallon of gasoline. Not terribly useful for those of us driving in the real world. The number you care about is range on a full charge, which in the Model S goes from 218 miles for the 60D to 315 for the P100D. The latest addition to the Tesla stable is an all-wheel drive only quasi-SUV. Underneath it’s similar to the Model S, so results are similar. It comes in four models–75D, 90D, 100D and P100D, parallelling the Model S offerings. Range is from 237 to 289 on a full charge for this heavier model. Pricing runs from $85,500 to $135,500 for the basic models (yes, there are options that can be added!). These are not vehicles for the faint of wallet, but they promise quiet speed and all-wheel-drive capability along with seven-passenger capacity. Oh, and falcon-wing doors. We were impressed in a short drive in one. BMW is following through on its promise to electrify its entire lineup. The top-of-the-line 7-Series gets a boost and delivers an impressive potential fuel economy with the sophisticated BMW plug-in hybrid system. We had a chance to test drive this car recently, but here’s the quick summary. You know guilt-free premium chocolate; this is it in SUV form. Plug it in overnight and run 14 miles on electricity only. After that an efficient 2.0-liter gas engine kicks in. The power is substantial and you may need it if you load this beast up with a full seven passengers. Even running on the gas engine this is one big, quiet machine that delivers everything you’ve come to expect from a BMW–exhilerating performance, precise handling, admirable craftsmanship and a full contingent of technology. It comes at a price, though, with the first plug-in BMW SUV starting at $62,100. We have driven this, Volvo’s first plug-in wagon (if you don’t count the engine block heaters on cold-weather models), and came away impressed with the whole package. Like the BMW, the electric only driving range is short (17 miles), but the efficiency boost is substantial. Also like the BMW, the whole package of the Volvo XC90 is impressive. It can haul seven passengers in luxurious comfort and moves quickly and quietly to any destination you point it towards. The Volvo XC90 T8 model starts at $68,100, which seems to be the new sweet sport for big plug-ins with all-wheel-drive. Mercedes is moving into the plug-in business as well, and its AWD contender is its mdsize SUV that delivers not only great fuel economy but performance from a bi-turbo 3.0-liter V-6 engine and hybrid system that puts out a combined 436 horsepower. Its the first of many more plug-in models Mercedes has promised. The GLE 550e starts at $66,300 with a good dose of the luxury items you’d expect in a Mercedes, including a variety of safety technology features. The BMW 328d xDrive Sportswagon we tested really hit a sweet spot trifecta–all-wheel-drive, wagon, diesel fuel economy. With the heavier wagon configuration, the EPA numbers top out at only 40 mpg. If you opt for the all-wheel drive 328d sedan, you should be able to easily beat the EPA’s 43 mpg mark since we could hit that in the wagon. Packing a four-cylinder diesel, the 328d in any form delivers solid on-road performance and the expected slick handling. The details inside and out mark this as a luxury performance car. Prices for the sedan start at $34,145; the wagon begins at $44,150, but it’s easy to load $15,000 of options on top of that. A reinvigorated Jaguar has jumped back into the luxury car mix with a new diesel engine that allows its models to match its German competition in fuel economy. Our drive of the gas-powered Jaguar XE left us excited, but expectant that the diesel could satisfy more of what we’re looking for at Clean Fleet Report–fuel economy that doesn’t compromise on performance. the XE model starts at $34,900 while the larger XF retails for $48,250. The Mercedes on this list is a bit of a sleeper. Like the BMW 328d, it’s a diesel, which accounts for its great fuel economy. In the U.S., the sedan is the only high-mileage all-wheel-drive sedan available from Mercedes. You can get an all-wheel-drive coupe, but only with a gasoline engine that maxes out at 29 mpg. Europe, of course, has many more options available. The Bluetec sedan starts at $55,150 and comes with a 2.0-liter turbodiesel engine that puts out power comparable to a V6. It’s mated to a seven-speed transmission. The only catch is this is a 2016 model and Mercedes 2017 models introduced so far have not included a diesel option. This one is a companion to the 328d mentioned above. This is a testament to what diesel engines do well-they move things efficiently. Even an all-wheel-drive car as big as a 5-Series BMW sedan. We were impressed with the four-cylinder diesel in the 3-Series when we tested it, so you can imagine the power delivered by an inline turbocharged 3.0-liter diesel. Well, you don’t have to imagine it; the specs are 255 horsepower and 413 lb-ft of torque. To have that kind of power in a good-handling sedan that also gives you this kind of highway fuel economy. Let’s just say it’s $66,795 that you’ll appreciate spending every time you get behind the wheel. Subaru used to own this category. All of its cars are all-wheel drive, and they get reasonable fuel economy. But, while Subaru made incremental improvements to its boxer engines, the companies listed above moved on to newer technologies and are delivering leaps in fuel economy. Subaru continues to hold a solid place on this list and should be commended for continuing to offer its great and popular cars. 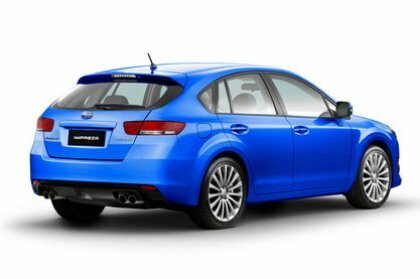 The Impreza is the entry-level Subaru, a compact with a reputation for performance in its WRX model and durability and functionality in its more pedestrian 2.0-liter models, which of course are the ones that deliver the best fuel economy. Subaru is to be commended for its continual improvement and focus since it sells a whole lot more of cars–and at reasonable prices–than any of the others on this list. Just to reinforce that, the Impreza starts at $18,295 for its 2.0-liter models, which come in sedan and hatchback configurations in three trim levels, but all are capable of hitting 37 mpg on the highway. We’ve haven’t tested an Impreza in some time, but hope to get back behind the wheel soon. Many more are bubbling just below this mark, including hybrids, plug-in hybrids, diesels and very efficient gasoline models. The choices seem to just get better for U.S. car buyers, even if they need an all-wheel drive model. With fuel economy a given, it now becomes a matter of matching your pocket pocket and specific needs with the vehicles that are available. We’ve got more road tests of these vehicles coming up soon, and we expect more cars to be joining this crowd in the coming months. For millions that face snow and icy roads 10, 20, or even 40 percent of the year, a car or SUV must safely navigate dangerous conditions and still deliver good fuel economy. Winter storms and gasoline approaching $4 per gallon in remote locations make these dual demands more important. A four-wheel drive provides better traction on ice by delivering power to all four wheels when the driver selects 4WD. All wheel drive vehicles (AWD) automatically deliver power to all wheels. Winter and mountain safety is further improved with snow tires or good all-weather radials. Added vehicle weight can help. Now you can have AWD and 4WD cars and SUVs that still deliver good fuel economy. Whether you are taking your kids to school in Chicago, getting to work in Washington D.C., or running a taxi fleet in New York, an AWD may help you through the storm. Is AWD really safer? You will have better traction starting from a parked position in snow and ice with less wheel spinning. The traction may provide better handling while driving. AWD is some states can allow you to legally drive without putting on chains, while others must pullover and add them. There is no guarantee that AWD will help you stop any faster. Only you can decide if all wheel drive is worth the added purchase price and fuel cost compared to crossovers and sedans that get better mileage, increasingly over 40 miles per gallon. This list was developed by first searching the U.S. EPA and DOE’s valuable fueleconomy.gov, then reviewing details on the vehicle maker websites. EPA combined miles per gallon rating is based on 45 percent highway/55 percent city driving although the typical American driver actually drives the opposite (55 highway/45 city). so the high highway numbers of the cars cited are significant. Of course when electricity enters the equation, sensitivity to speed, terrain and temperature increases so, as is always true–your mileage will vary! The average U.S. household has two cars. A growing trend is to put the most miles on the car with great fuel economy and have a larger second vehicle for trips with passengers and tough road conditions. We expect more premium and mainstream AWD plug-in hybrids from Audi and BMW and others. Mitsubishi may be the first with an affordable AWD plug-in hybrid, if and when its Outlander model ever reaches these shores. Instead of spending a small fortune to own a vehicle that gets you through the worst day of the year, consider what best meets your needs 350 days per year. When I lived in New Hampshire, I got along fine without AWD, driving my Saab with good all weather radial tires. Now living in California, my Prius did surprisingly well during the few days each year that I was on bad winter roads in the mountain, although I sometimes went through the hassle of putting on chains. When we needed an SUV for the 2002 Winter Olympics, we rented a Ford Escape 4WD and were glad that we did. Consider renting an AWD if you rarely face icy roads. When that 100-year storm hits, relax. Schools are closed and you can work at home that day. Lots of room and premium comfort. Thanks for a great blog of the pros and cons of AWD which I am making decision about. I appreciate the ideas and examples presented. The 4WD and AWD classifications are becoming more arbitrary as technology (particularly electronics) progresses. Traditional 4WD has meant body-on-frame set ups that did have additional weight with an added componentry compared to 2WD versions of the vehicles in order to drive the extra two wheels; the axle is already there. In the most basic terms, what is added is the ability to drive the second set of wheels, which does entail added driveshafts and weight. AWD vehicles also add more weight because of added drive components, but they typically rely more on electronics and sensors so have less of a weight penalty. With modern electronic controls the fuel economy penalty for AWD (and 4WD) had almost disappeared. In general, AWD models are most likely to have lesser fuel mileage ratings than the equivalent 4WD models because AWD system adds some extra weight to the vehicle, and thereby reduces the MPG rating as well as overall performance. Gas vehicles are a better choice over Diesels in colder climates. One comment I would make on the list is that following the EPA fuel economy numbers can be deceiving for folks who use AWDs and 4WDs in the usual fashion–that is, hauling several people and luggage over long distances. The EPA skews its combined mpg ratings to 55% city/45% hwy, the opposite of the typical American driver according to the government’s own statistics gatherers. My educated guess is folks with AWD vehicles are biased even more toward the open road so the highway fuel economy is even more significant. They get almost as good fuel economy as small SUVs like the RAV4 and Subarus on the highway and can easily fit up to 7 passengers and luggage. Oh, and you’ll find diesels are much more consistent at delivering the rated fuel economy numbers than gasoline vehicles, again, as documented by the EPA in their investigation of 2008. Anyway, some more vehicles to add to the list.